Seriously, what’s the probability of two modern submarines having a “fender bender” in the Atlantic? And of two satellites doing a bit more than that? How about both of these incidents occurring within weeks of each other? Lots of numbers going on in that calculation and it’s keeping me up at night! Well, that, insomnia and getting this strip out twice a week. 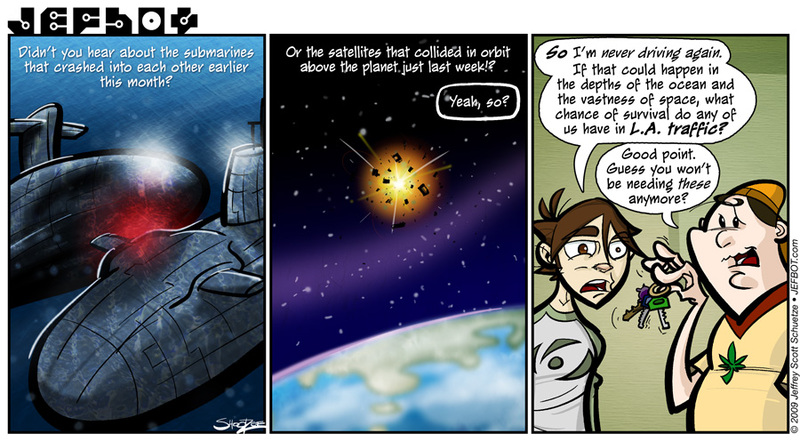 I’m glad I own neither a submarine or a satellite. Insurance rates for those babies has probably skyrocketed because of this. heheh. i wonder if aflac has a plan for either of those, Wyvv? I have a bad feeling about Cornfather and those keys! Jefbot needs to watch out! Artwork on this strip gets way more than 2 thumbs up! it’s true that the Cornfather can’t be trusted, Spanky. we’ll see if he does anything with those keys, though. 🙂 thanks for the multiple thumbs up on the artwork! thanks, Cornacchia. i agree, the 405 is absolutely no consolation at all! another stellar strip! i think you should stop driving. people don’t really need cars to commute to westlake village. believe me, if i could get to westlake village without driving i would, g. got a spare jet pack? I think the first panel is my favorite, the underwater/steel texture is a really neat touch. California traffic doesn’t bother me that much, it’s the collisions with stationary objects that worries me. What’s your excuse then?! thanks for the kind words about my artwork, Foxmouse. and i’m pretty much concerned with colliding with anything – moving or stationary! heh, so true. Though statistically you are safer in a Plane, so maybe JefBot should get his flying license? sounds like a good solution to me jh3, but i don’t think jefbot could afford one at the moment. I love it! First of all… so true! I’m afraid to drive too! Second, I LOVE THE COLOR OF THIS STRIP!!! It’s beautiful. Finally, what about flying? I fly a lot for my job, and I just don’t feel safe in the air anymore either…. How long before we can teleport??? i ask myself that question every time i get into my car, funnyshaffer! Years ago, I used to commute from Costa Mesa to Pasadena on a motorcycle. Jefbot’s expression is about how I feel looking back on it. I was gonna say that then I would take public transportation instead of driving (Puerto Rico doesn’t have trains), but then… the bus driver could collide with anything on the road (and there have been lots of train accidents as well!). So my solution? To hide under my computer desk. i absolutely agree with you about biological collisions there, reynard61. i guess teleportation’s out now, too. 🙁 brundlebot! So much for ‘two ships passing in the night,’ eh? The disconnected and terrified look in jefbot’s eyes in the last panel are perfect. You can tell, with ease, that he’s picturing some awful wreckage. Great strip. I worry about this ALL THE TIME. glad you share in jefbot’s (and my!) fears, Shan. There’s no way you can move fast enough in LA traffic to have a collision that will be any more than a fender bender. I laugh when I see signs that read “Speed Limit 65 mph” Might as well make it 87, because I’m stuck in a parking lot! True dat. I wonder if someone let out a Ping after the collision between the subs. Love crazy Big Eye/Little Eye. Great job on those submarines! Your coloring skill continues to impress me more and more! thanks, Stan! i appreciate the compliment. dude, you are so right… LA traffic is the scariest of all! A british sub, i’m driving accross britain for an anime expo, i must be extra vigilent! I share your fear! I’m more worried about all the Kamikaze birds out there. A plane hit a turkey vulture the other day. They are getting smarter…..duh duh DUUUHHHH!!! The art is spectacular…and I did wonder about the collisions…. and now with the huge debris field created by the collision, there’s even more junk floating around up there, Skreyola! more collisions to come, certainly. LoL it does help drivers in that they have sight to help them out, whereas people in submarines have to rely on equipment that could be faulty, and satellites have no crew to correct their courses. So I’d say, all in all, drivers have a much better survivability rate than satellites or subs. Great stip Bot! and that is why i never get on public transport. and now we know and knowing is half the battle. Just finished reading through your archives, and wanted to say I love your strip, some of them actually made me laugh out loud (I refuse to use leetspeek), and I am at work, luckily on my lunchbreak (mostly). And that eyeball close up scared the crap out of me when it popped up. I love the messages from friends and family, it really adds to the appeal of the strip. Just a comment on the sub collision, it is really not that much of a surprise, they were probably doing an exercise and practicing tracking/stalking each other, and they can get quite aggressive. With modern subs being so stealthy, tracking them is very difficult. These incidents are not that uncommon, although luckily it is usually minor damage, and don’t get much news coverage. More aggressive manoevering and collisions/incidents were quite common in the cold war U.S./U.S.S.R. days.